As a primary school teacher, I want the best outcomes for the children in my classes. I feel we should be teaching the whole child and not just how to pass standardised tests that measure a tiny proportion of what they can do. This is why I let the children in my charge use saws and light fires. This isn’t irresponsibility, it’s part of the growing use of Forest School in state education. 2) It takes place in a natural wooded environment to support the development of a relationship between learner and the natural world. 3) It promotes the holistic development of all those involved, fostering resilient, confident, independent and creative learners. 4) It offers learners the opportunity to take supported risks appropriate to the environment and themselves. 5) It is run by qualified practitioners. 6) It uses a range of learner-centred processes to create a community for development and learning. So, supported tool use allows children to further develop motor skills, design and fulfil projects (such as building nesting boxes) and overcome frustration when things go wrong. Supported fire use allows children to learn about the usefulness of fire, safety, respect for others and the land and responsibility for clearing up after themselves. 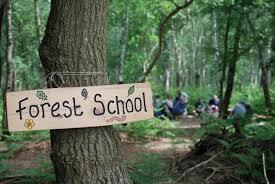 In my inner city school, Forest School has shown children how to get into and appreciate nature. It has helped children develop a love of being outside, exploring, discovering and creating. It has led to a group of children, in their free time, taking it upon themselves to water trees we had planted. It also led to one child just standing in the middle of a circle of trees and say ‘it’s all so beautiful’. This can’t be measured!